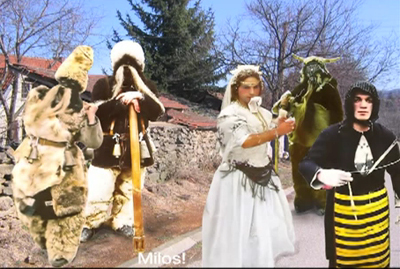 Melissa Potter’s short 2011 video Boy Brides + Bachelors will be screened as part of Durham, North Carolina’s hugely popular Strange Beauty Film Festival, a winter series of imaginative and striking short films from around the world. Potter’s work will be included along with other international documentaries, fiction, experimental, and the wholly unclassifiable time arts pieces that give audiences a chance to marvel at the everyday beauty and strangeness surrounding us. Boy Brides + Bachelors was shot on a cold January night in Southeastern Serbia during a ritual called Surovari. In this pagan ritual, men dress as women (large breasted peasants, grandmothers, and brides), and engage in pretend sexual acts with village bachelors. Little is known about the meaning and origin of this event, but its contemporary gender role-play implications are profound. “I used stop-motion animations to engage my questions about the underlying meanings of the ritual, and make a connection between my inability to translate much of what was going on with the strange language of gender itself,” says Potter of her process during the making of this four-minute short film. For more information on the Strange Beauty Film Festival, click here.